Otakuthon Idol is a contest, which is looking to bring out the next Gackt or the next KOTOKO that is sleeping inside you! If you are lucky enough to be one of the selected participants, you could sing on stage and have the chance of winning the title "Otakuthon Idol 2016". To participate, you must learn a Japanese song by heart and be present at the auditions. If you are selected, you will then be able to perform on stage in front of our judges, who will evaluate your performance. Don't forget to bring a compact disc containing the karaoke version of your song! Too shy to go on stage alone? No problem! You can perform in groups! Wait no longer and start rehearsing right now! If you aren't interested in singing, you could always attend the show where our participants will try their best to entertain you. But more importantly, don't forget to bring along your friends! Registration for Otakuthon Idol auditions will be held on Friday August 5 at 10:00am in room 516C. Contestants must sing alone OR in a group of up to 4 members. Contestants may choose one song from J-Pop, J-Rock, Visual-Kei, anime, manga, game, musical or Enka sources. If a Japanese version and an English/French version of the song exist, only the Japanese version can be used. Example: English versions of Real Emotion or Melodies of Life aren't allowed but songs like Life is Like a Boat or I'm Alive by Becca can be used. (Do not forget that you are judged on the difficulty level of the song you choose). The song may be no shorter than 2 minutes and no longer than 6 minutes. The contestant must have the lyrics memorized. No cue cards or sheets will be allowed. The contestant must provide an audio CD (no MP3s, WAVs or other formats will be accepted) with an official karaoke track of the song they will be performing. The song must be the ONLY track on the CD, must be an original recording (ie: no MIDI, no instrumental only tracks), and must not have been modified in any way from the original (ie: no vocal cuts, remixing, or additional editing). The contestant will be responsible for his/her audio CD at all times. Otakuthon Idol will not be held responsible for the loss, theft, or damage of any CDs. Lip-syncing will not be permitted. The contestant may perform a "skit" before their song, but the whole performance may not exceed 6 minutes. The contestant is permitted to cosplay during the performance, but the costume will not be judged nor taken into consideration for the final results. Auditions will be held in a designated room. The time allocated for auditions will be limited to the above-indicated time slot. Contestants will be auditioned on a first-come, first-served basis and must be ready when called in front of the panel of judges. They will need to fill out a form prior to the audition (i.e. : name, song, etc.) and submit one audio CD with the karaoke track of the song which they will perform (it should be well-labeled with the contestant's name and title of the song). Contestants will be asked to perform 60 seconds (or less) of their song without the lyrics. Once the auditions are complete, the results will be compiled and a list of all the finalists will be displayed near the audition room. 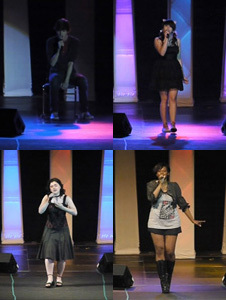 The judges will select 9 finalists: 6 for solo performances and 3 for group performances. The names of the runners-up will also be posted in the event one of the nine finalists is absent for the competition. Note: there will be one solo runner-up and one group runner-up. The nine finalists and the runners-up will be required to attend a preparation meeting approximately one hour prior to the live contest. If a finalist is late by more than 10 minutes, the runner-up will officially take his place.